Hemsley Hurtle Stanley Marshman born 09 December 1883 at Grace Plains, South Australia, Australia. He completed his basic training in A Coy, 2nd depot battalion from 16 Sep 16 to 3 Oct 1916. He joined "A" company Mitcham on 3 Oct 1916 and served in that unit until 31 Oct 1916. On 1 Nov 1916 he Joined the MOO School Mitcham serving until 16 Dec 16. Pte Hemsley Hurtle Stanley Marshman 6530, enlisted in the Australian Imperial Force 16 September 1916 and served in 50th Infantry Battalion until killed in Action 15 October 1917 at Broodseinde Ridge, Belgium. Hemsley Marshman was posted to 27th Infantry Battalion 19th Reinforcements on 16 Dec 1916. He embarked aboard HMAT A28, Miltiades, in Adelaide, South Australia on 24th January 1916 as part of the 19th reinforcements for 27th Battalion which was fighting in France. Private Hemsley Hurtle Stanley Tiller 6530, embarked at Adelaide, South Australia, Per H.M.A.T A28, "Miltiades," 24th January, 1917 as part of the 27th Infantry Battalion - 19th Reinforcements. proceeded overseas to France and joined 2nd A.D.B.D at Havre, France. Hurtle Joined the 50th Battalion on 7th Aug 1917 and was immediately thrown into action. The 50th Battalion was part of the the Third Battle of Ypres which commenced in July 1917 and lasted until the 10 November 1917, They fought in the Battle of Polygon Wood between 26 September to 3 October 1917. On 10 October 1917 they were ordered to take up positions near Zonnebeke, Belgium. They experienced moderate hostile artillery with heavy bursts during the day. The weather was very wet and the ground very muddy. On 13th October 1917 the company was ordered to the front and to take up positions at Broodseinde Ridge. The Commanding Officers entry in the war diary for the 15th of October 1917 States "Scattered Shelling by enemy during day. Mid Afternoon enemy began shelling 150 yards in front of our line. At 8 pm a patrol from our line worked forward about 800 yards without encountering enemy. Enemy was then shelling about 1100 yards forward of our line and his flares were going up 1500 yards from us. Enemy apparently has fallen back from the ground in front of us to Kelberg Ridge 2000 yards east of our line. Enemy shelled Broodseinde Ridge continuously during night. Winds above normal, ground drying. A & B coy relieved by C & D Copy 9:30pm. casualties: Killed Officers 1 Other Ranks 42, Wounded Officers 1 Other Ranks 99, Sick Other Ranks 29, Total Casualties during tour Officers 2 Other Ranks 170. The company had taken heavy casualties and was short of stretcher- Bearers. Pte Sevenson stated to the Red Cross that he heard Hemesley Marshman volunteer to fill the gap in Stretcher Bearers, as the Battalion had been badly knocked about. Hemsley, with 3 others were carrying a wounded man down the duck boards, when a shell burst near them, killing Hemsley and mortally wounding Lance Cpl Stevenson, one of the other stretcher Bearers carrying the stretcher with him. He said Marshman was killed instantaneously. The 4th Stretcher-Bearer got clear unwounded. They were near the Dressing Station when Hemsley was killed. A red cross investigation was instigated to determine where Hemsley was buried. The Chaplain 52nd Battalion stated that he buried Hemsley at Zonnebeke on 16 Oct 1917 (Map reference S1 22.c1.1) in a small soldiers cemetery, just outside the dressing station (Soda Water Factory). See the attached Australian Red Cross Society Wounded and Missing Enquiry File. War Diary of 50th Battalion A.I.F. War Diary of 50th Battalion A.I.F. Page 66, 13 October 1917, Broodseinde Ridge, Belgium to 17 October 1917. This map shows the locations Ypres, Zonnebeke and Broodseinde Ridge. Support Trenches, Broodseinde Ridge, Near Zonnebeke, Belgium taken on 17 Oct 1917,2 days after Hemsley was killed. This photo of Broodseinde Ridge, Near Zonnebeke, Belgium, was taken on 4 October 1917, 11 days before Hemesley was killed. I've included this photo of stretcher bearers to give you an idea of the conditions and how Hemsley and his fellow stretcher bearers were carrying the wounded solder at the time he was killed. Remembrance Certificate commemorated in perpetuity by the Commonwealth War Graves Commission for Private Hemsley Hurtle Stanley Marshman. Hemsley Huxley Stanley Marshman was awarded the Victory Medal and the British War Medal Posthumously. The medals were presented to his widow, Ruby Ida May Marshman (n.Stoyel). Hemsley Hurtle Stanley Marshman's Grave is located in position PlotI,position J1. Private Hemsley Hurtle Stanley Marshman body exhumed and re-intered. Hemsley is buried at the Divisional Collecting Post Cemetery and Extension which is located to the North East of the town of Leper, Belgium. His grave location is Plot 1 Row J Position 1. Headstone of Hurtle Hemsley Stanley Marshman in France. Hurtle's headstone is located in the Divisional Collecting Post Cemetery and Extension, Northeast of the town of Ieper, Belgium. His grave is located in position: Plot 1, Row J, Position 1. Hemsley Marshman served in the 50th BN Australian Inf. during the first World War and was killed and buried at Zonnebeke, France. Methodist Church Exeter, South Australia, is now known as the Uniting Church Samaphore, South Australia. Hemsley Hurtle Stanley Marshman married Ruby Ida May Stoyel 08 Aug 1912 at the Methodist Church, Exeter, South Australia, Australia. The church is now known as the Samaphore Uniting Church. Hemesley Hurtle Stanley Marshman married Ruby Ida May Stoyel 8th August 1912 at the Methodist Church, Exeter, South Australia. This notice was published in The Advertiser Newspaper, Saturday 17 August 1912, Page 18. Semaphore Uniting Church is located on the corner of Young and Samaphore Streets Exeter, was built in 1867 as the Methodist Church Exeter. The beautiful bluestone came from the ballast that came from ships during the 1800’s. In 1977 the church became part of the new Uniting Church in Australia. [S1] The Tucker Family in Australia, Cynthis Henley-Smith, (Gillingham Printers Pty Ltd Adelaide, South Australia), 107 (Reliability: 3), 1992. [S7] South Australian Birth registrations 1842-1906, South Australian Genealogy and Heraldry Society Inc, (Macbeth Genealogical Services Pty Ltd), District Cod Gil, Book 317, Page 343 (Reliability: 3), 9 Dec 1883. [S64] World War I Military Service Record, Australian Government, (Australian National Archives), 14 (Reliability: 3), 16 Sep 1916. See attach World War One Military Service Record. [S64] World War I Military Service Record, Australian Government, (Australian National Archives), 14 (Reliability: 3), 16 Dec 1916. 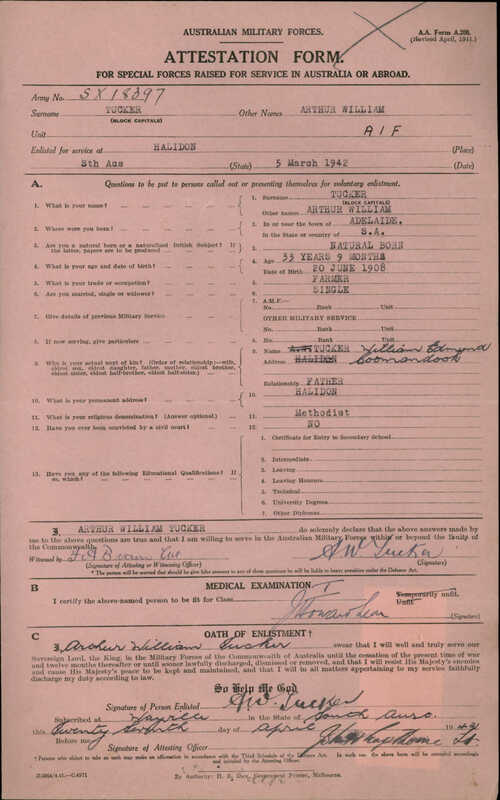 [S64] World War I Military Service Record, Australian Government, (Australian National Archives), 14 (Reliability: 3), 27 Mar 1917. [S64] World War I Military Service Record, Australian Government, (Australian National Archives), 14, 23 Jul 1917. [S64] World War I Military Service Record, Australian Government, (Australian National Archives), 14 (Reliability: 3), 7 Aug 1917. [S308] World War 1 Military Unit War Diary, 66 (Reliability: 3), 13 Oct 1914. See attached copy of 50th Battalion AIF War Diary, Page 66 dated 13 Oct 1917 - 17 Oct 1917. [S306] Australian Red Cross Society Wounded and Missing Qnquiry Bureau Files, 1 - 9 (Reliability: 3), 15 Mar 1918. See attached Australian Red Cross Society Wounded and Missing Enquiry Bureau Files 1914-18 War 1DRL/0428, 6530 Private Hemsley Hurtle Stanley Marshman, 50th Battalion. [S64] World War I Military Service Record, Australian Government, (Australian National Archives), 2 (Reliability: 3), 15 Oct 1917. [S306] Australian Red Cross Society Wounded and Missing Qnquiry Bureau Files, 2 - 9 (Reliability: 3), 15 Mar 1918. See attached Australian Red Cross Society Wounded and Missing Enquiry bureau Files, 1914-18 War 1DRL/0428, 6530 Private hHn. [S306] Australian Red Cross Society Wounded and Missing Qnquiry Bureau Files, 2 (Reliability: 3), 15 Mar 1918. Marshman H.H.S. 6530 was buried by me at Zonnebeke ........ page 2 of the Red Cross report. [S306] Australian Red Cross Society Wounded and Missing Qnquiry Bureau Files, 2 (Reliability: 3), 16 Oct 1917. [S34] National Archives of Australia, 37, 1992. See page 37 of Hemsley Hutley Stanley Marshman's World War 1 Military history documents. [S64] World War I Military Service Record, Australian Government, (Australian National Archives), 16 (Reliability: 3), 25 Mar 1927. [S27] South Australian Marriages Registrations 1842 - 1916, South Australian Genealogy and Heraldry Society Inc, (South Australian Genealogy and Heraldry), District PtA, Symbol A, Book 252, Page 344 (Reliability: 3), 8 Aug 1912. See attached Marriage Registration form. [S143] The Advertiser Newspaper, 18 (Reliability: 3), 17 Aug 1912. See attached Marriage Notice published in The Advertiser Newspaper, Adelaide, South Australia, Saturday 17 August 1912, Page 18. [S247] Chronicle Newspaper, Adelaide, South Australia, Australia, 34 (Reliability: 3), 24 Aug 1912. See attached Marriage Notice published Chronicle Newspaper, Adelaide, South Australia, Saturday 24 August 1912, Page 34. [S304] The Mail Newspaper, Adelaide, South Australia, 3 (Reliability: 3), 21 Sep 1912. See attached story reporting the Wedding of Hemsley Hurtle Stanley Marshman to Miss Ruby Ida May Stoyel. Published in The Mail Newspaper, Adelaide, South Australia, Saturday 21 September 1912, Page 3.